This is a book of short homilies on the Gospels for the Sundays and celebrations of Years A, B and C. Each homily discusses in a simple and straightforward way the core message of the reading and its application to everyday life. It makes a wonderful companion and guide for those who prepare the homilies as well as those who want further reflection on what they hear at Mass. Dr. Joseph Pollard has spent most of his priestly life in California where he served as Director of Adult Education for the Archdiocese of Los Angeles and later as Communications Officer. He has been pastor of two parishes and Director of the Theology Department at St. John’s Seminary, Camarillo, California. He has done parish ministry in the West of Ireland and lectures in the School of Humanities at the Galway-Mayo Institute of Technology. He has received papal honors from Pope Paul VI and Pope John Paul II. Pollard currently lives in Castleblakeney, Co. Galway, Ireland. 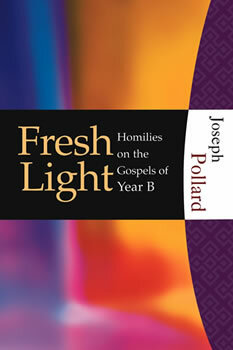 Available for each of the liturgical years or as a set of all three volumes [$39.95 (list: $48)]. Please specify your preference when ordering.